Taiwan’s oolong teas are so good that they have been described as the “champagne of tea.” In recent decades, Alishan High Mountain tea has stood out from the crowd as the most sought after Taiwanese tea. In fact, my (Taiwanese) father-in-law, an avid tea drinker, turns his nose up at anything that isn’t Alishan tea. 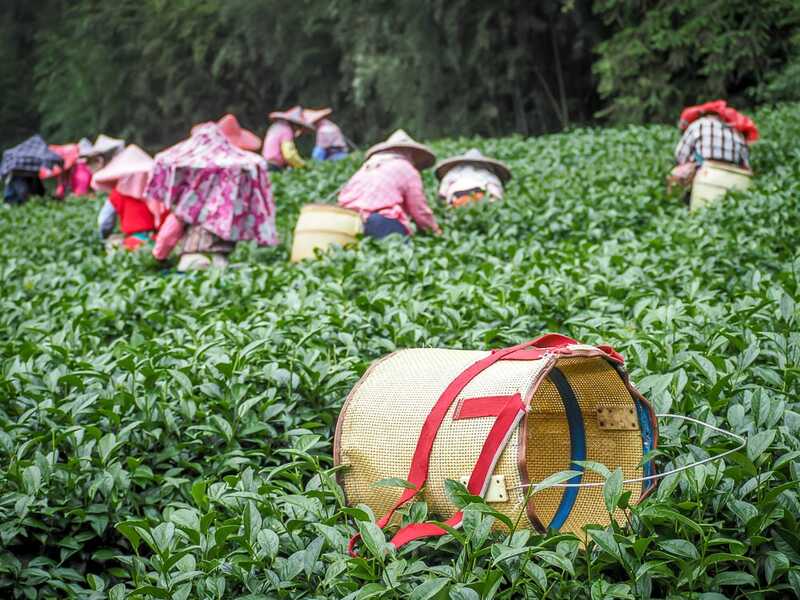 Demand for Alishan oolong tea surpasses supply, which has even given rise to “counterfeit” Alishan tea grown elsewhere in Asia. In this article, I will explore how Mount Ali High Mountain tea (Alishan gao shan cha or 阿里山高山茶) came to be Taiwan’s most popular, what it’s like, how it’s prepared, how to brew it, how to visit a tea farm in Alishan, Alishan’s lesser known black teas, and where to buy Alishan tea in Taipei or how to order Alishan tea from abroad. 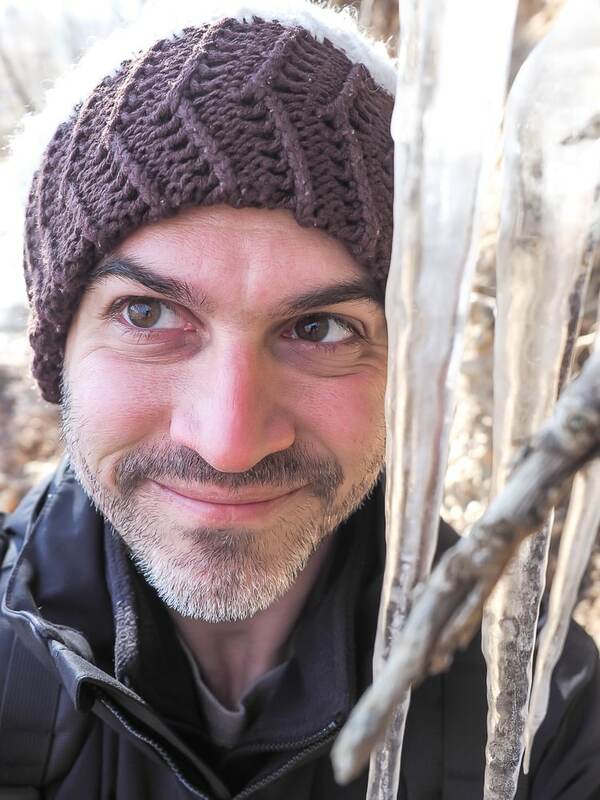 All the pictures in this article where shot on trips I’ve made to the Alishan tea growing area. 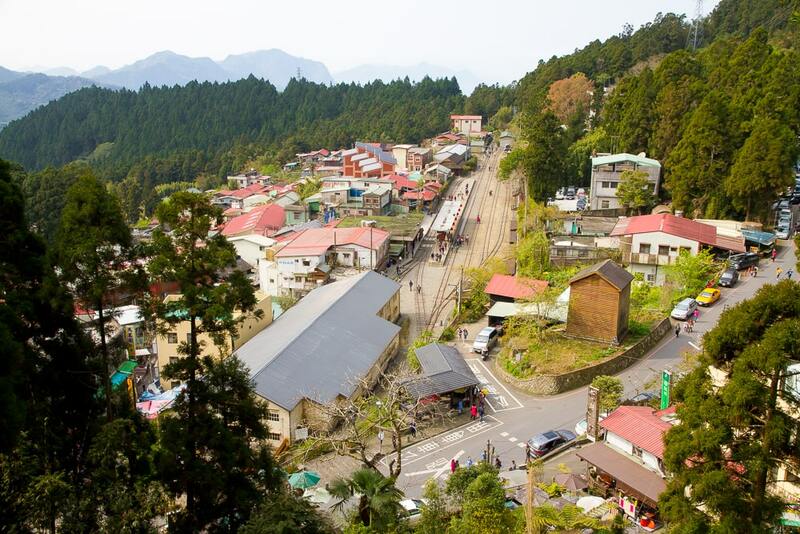 For more details about traveling to Alishan, see my comprehensive guide to Alishan and article on how to get to Alishan. You may also be interested in my article on Sun Moon Lake teas, which includes Taiwan’s most famous black tea, Ruby Red #18. What does Alishan High Mountain Tea Taste Like? Alishan High Mountain Oolong tea’s key characteristics are its complexity, floral notes, and a slightly sweet, long-lasting aftertaste. The tea’s aroma is herbal and floral, compared by some to orchid, rose, or jasmine. The flavor is equally complex and floral, sometimes with hints of fruit such as peach. 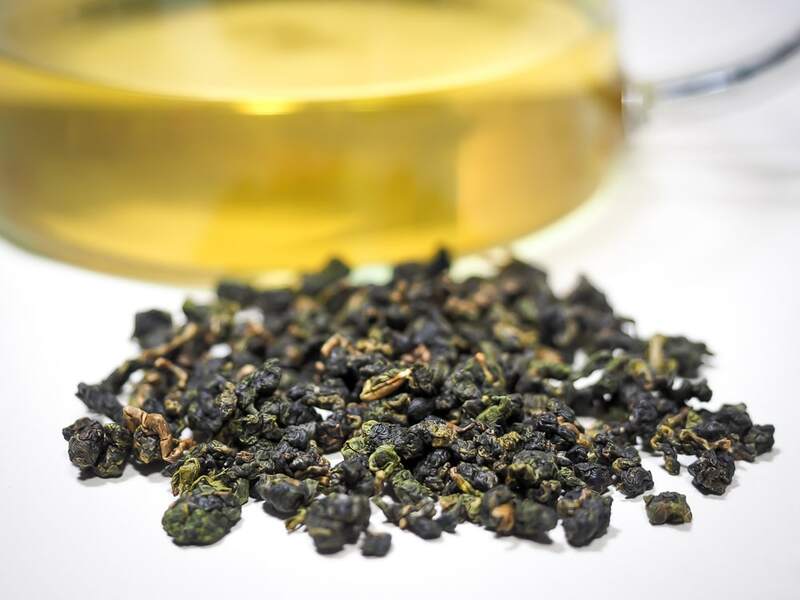 Alishan oolong tea is usually made with one of two tea cultivars. The Golden Lily (Jinxuan or 金萱) cultivar produces tea with a milkier or creamier mouthfeel, while the Qingxin (青心) variety tends to be bolder, sweeter, fruitier, and more floral. When Alishan teas are roasted, a toastier depth is added to them, but many of them are lightly roasted or not roasted at all, preserving a greener, more vegetal taste. The below photos are examples of Alishan High Mountain Jinxuan Tea (top) and Alishan High Mountain (Qingxin) Tea (bottom) varieties of Alishan High Mountain Tea from my favorite Taiwan-based supplier, Eco-Cha. I love and recommend Eco-Cha because they responsibly source artisanal teas from small, family-run farms that practice environmentally friendly methods of cultivation. The owner, Andy, takes the time to personally visit and develop relationship with the tea farms they source from. The photos below are my own. If you click on this link, or enter the code NKTEA at checkout, you will receive 10% off any Eco-Cha order. I found the Jinxuan version of Alishan tea from Eco-Cha to be light, incredibly vegetal, and displaying the milky or buttery mouthfeel that is characteristic of Jinxuan teas. As you can see in the photo on the top, its rolled leaves are greener and its pale yellow colored liquor slightly lighter. The regular Alishan High Mountain tea from the same farm has slightly browner dried leaves and darker liquor, likely from more oxidization. The flavor is also bolder and sweeter in comparison. While their characteristics differ, but both teas taste clean, fresh, and are, in my opinion, exemplary examples of fine, artisanal Alishan High Mountain tea. 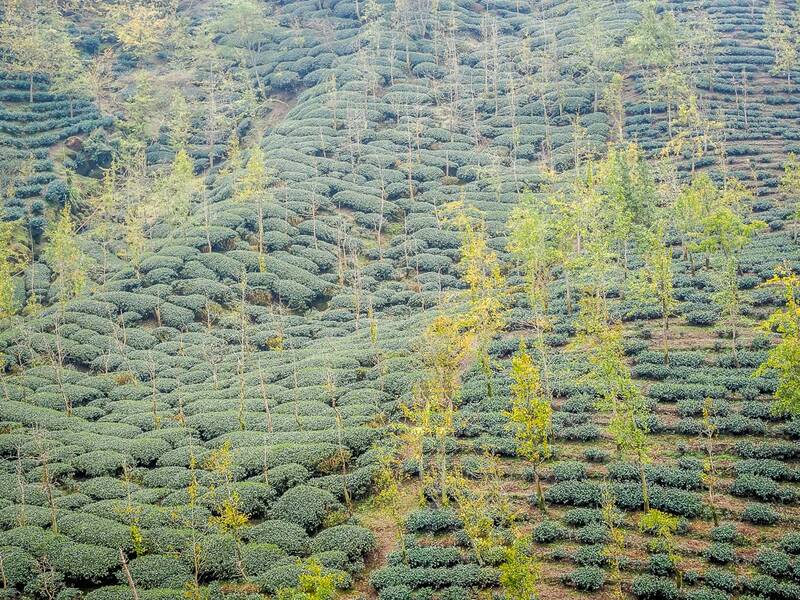 The teas are sourced from a family-run farm in Ruili, in the greater Alishan region. Ruili is not one of the two famous Alishan tea growing villages that I will discuss below, but it is not far from them. 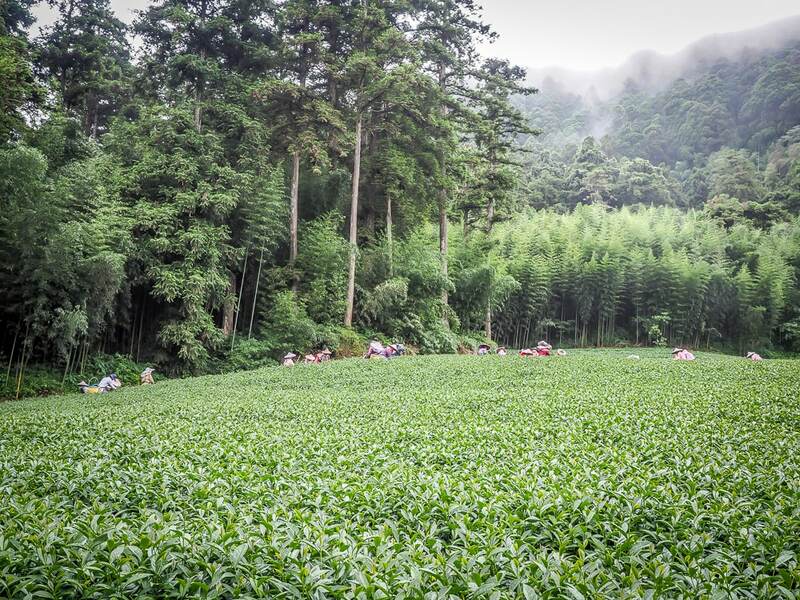 According to Eco-Cha, Ruili has become a more popular source of Alishan tea in the last 10-15 years, but it remains largely unknown to tourists, especially compared to the more popular and overdeveloped production regions. 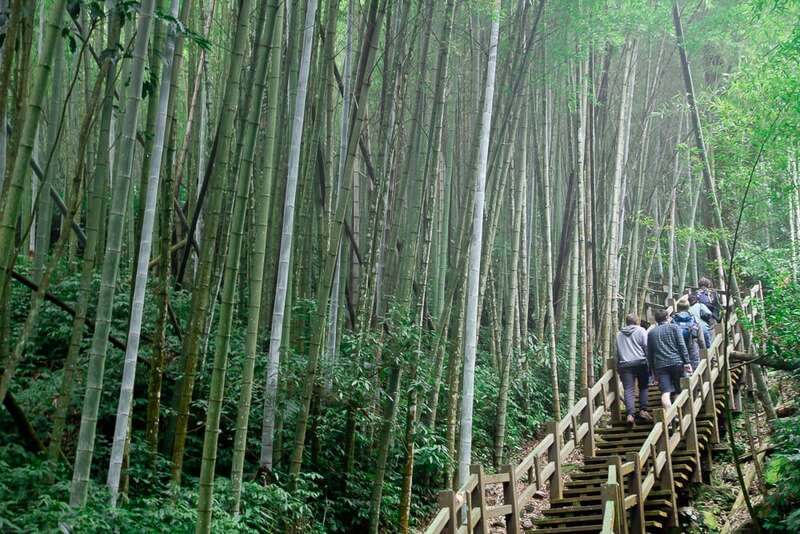 I actually visited Ruili years ago to hike the incredible, I would even say mystical, Ruitai Historical Trail from Ruili to Fenqihu, a 3-4 hike through swaying, creaking bamboo forests. The moment we got off the mini-bus, which only comes twice per day, in Ruili, we were faced with vertical tea farms on one side of the road, and vast forests of bamboo on the other. If you want to get off the beaten track in drop-dead gorgeous Taiwan tea country, this is a great place to do it! The term Alishan or Mount Ali is misleading, because it is not a single mountain. Rather, it refers to a mountainous region in Chiayi County, Central Taiwan that encompasses some 25 peaks over 2000 meters in height, with the tallest being Datashan (2663m). 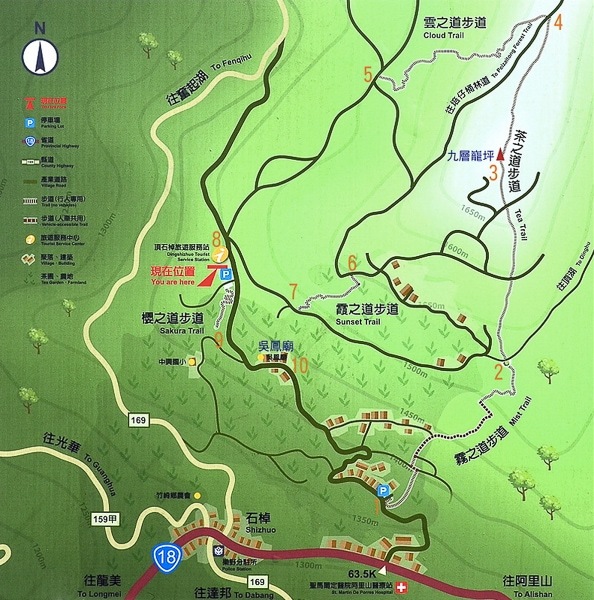 Usually when people mention Alishan, they are referring to the Alishan National Forest Recreation Area, one of Taiwan’s top tourist attractions. 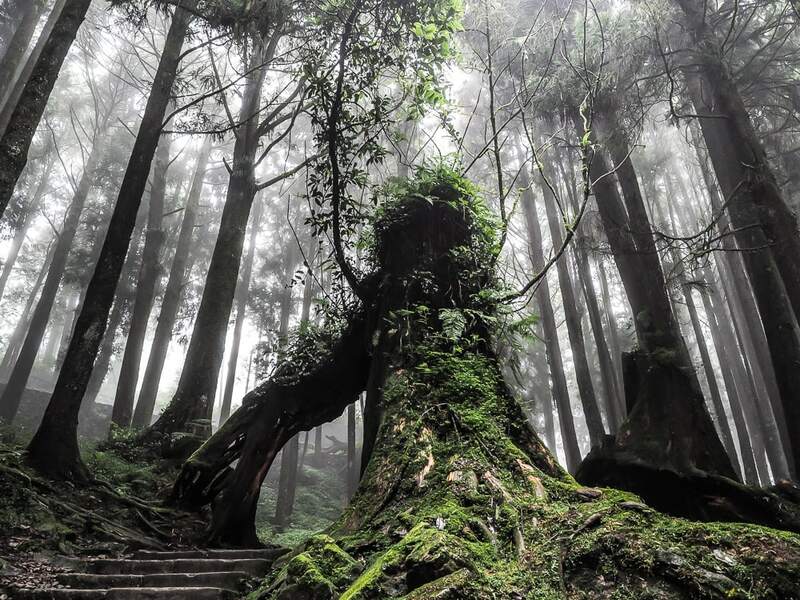 The popularity of Alishan goes back to the Japanese era (1895-1945), when the colonial administration built a small-gauge train line to log the huge hinoki (the Japanese term for cypress) trees that grow in the area. 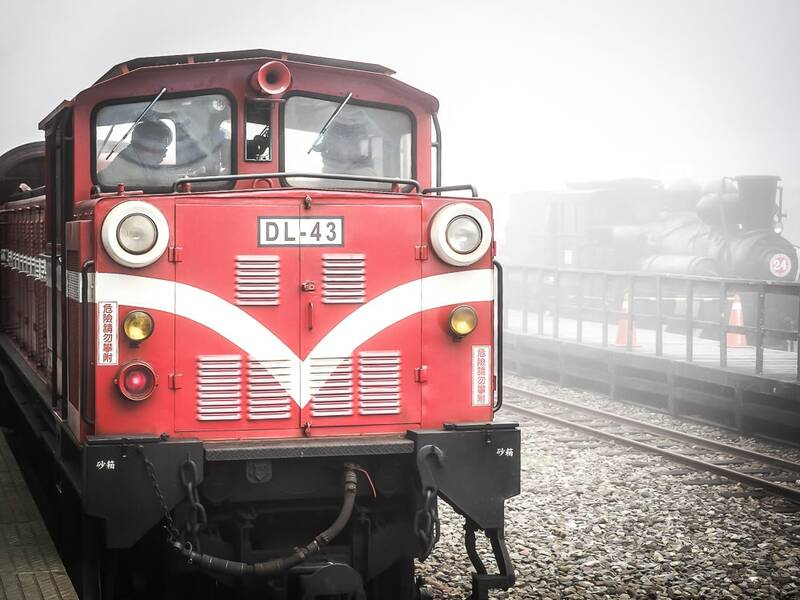 The train line still operates today, transporting not trees but tourists, who flock to Alishan en mass for its famed sunrises over seas of clouds (see my full Alishan article to find out the best sunrise viewing spots), hiking trails through ancient misty forests, and of course, its famed teas. To be honest, I’ve always wondered whether the mystique and allure of Alishan as a mountainous, mist shrouded tourist attraction has contributed in no small part to the fame of Alishan’s teas, but numerous tea competitions which are regularly held in Taiwan indeed confirm the superior quality of Alishan’s teas. It’s interesting to note that most Alishan teas are not grown in Alishan National Forest Recreation Area, but in the greater Alishan (township) area, and neighboring Zhuqi and Meishan townships between Alishan and Chiayi City. Most Alishan teas are grown in and around two villages, Shizhuo, sometimes written as Shizhao or Shizuo (石棹) and (樟樹湖) in Zhuqi and Meishan, respectively, but near the border with Alishan township. 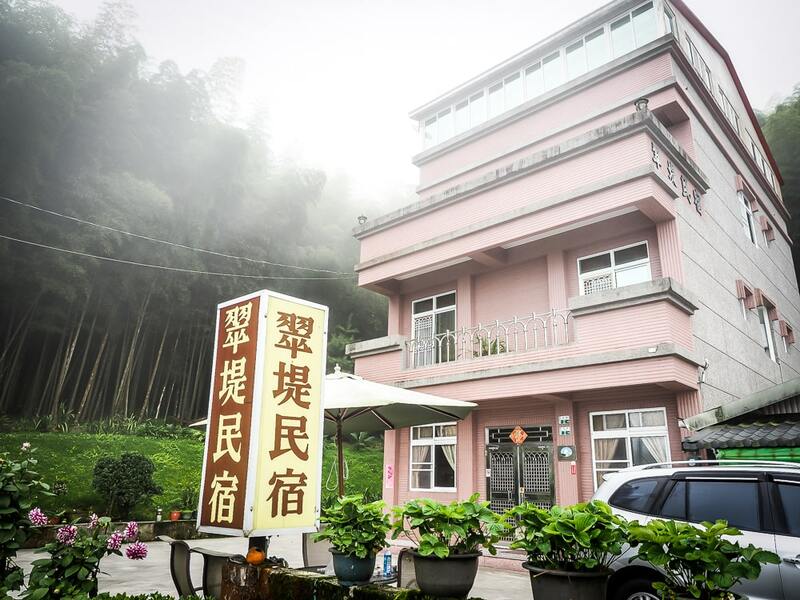 In fact, many tourists who take the bus up to Alishan drive right through Shizhuo without even realizing they are passing through farmland that produces Taiwan’s most famous teas. See more information below about how to visit the area. 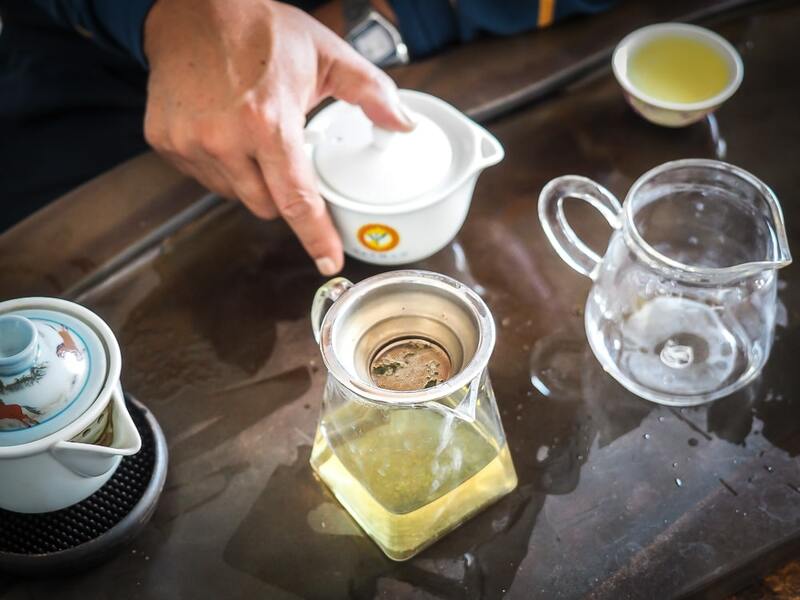 It may surprise you to learn that Alishan is relatively new on the tea scene in Taiwan. There wasn’t even a road to Shizhuo until 1983! Let’s go back a little first, though. While Taiwan has an indigenous tea plant that some regard as a third variety of tea (besides assamica (Indian) and sinensis (Chinese) varieties, which dominate global production), the first teas cultivated in Taiwan were brought over by Chinese migrants from the Wuyi mountains, a UNESCO World Heritage site, in Fujian, and planted in the Lugu area of Nantou, neighboring Chiayi (see my article on visiting the Xitou Monster Village and tea farms in Lugu). It soon became apparent that oolong (wulong) tea was most well suited to Taiwan’s terroir, and by the late 1800s, tea was Taiwan’s number one export, ahead of sugar and camphor. During the Japanese colonial era, the Japanese shifted production to black teas to compete with the English, and created the Tea Research and Extension Station (originally the Tea Manufacture Experiment Station) to boost Taiwanese production and create a number of tea hybrids that have since attained international acclaim and are grown in other countries, particularly in Southeast Asia. 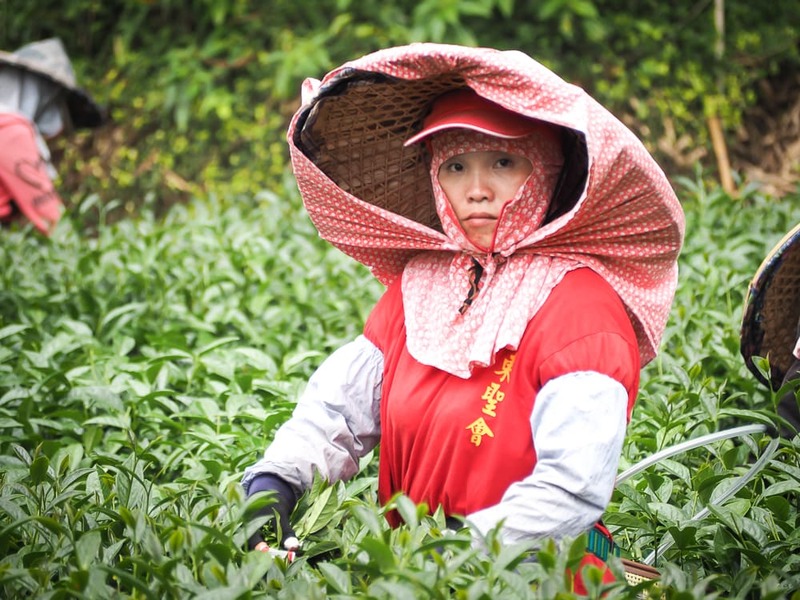 After cheap Chinese and Indian teas flooded the market in the 1950s and 60s, Taiwan went back to oolong production, and today focuses more on quality and special varieties than mass production, with most of its tea consumed domestically, but demand growing in international tea circles. 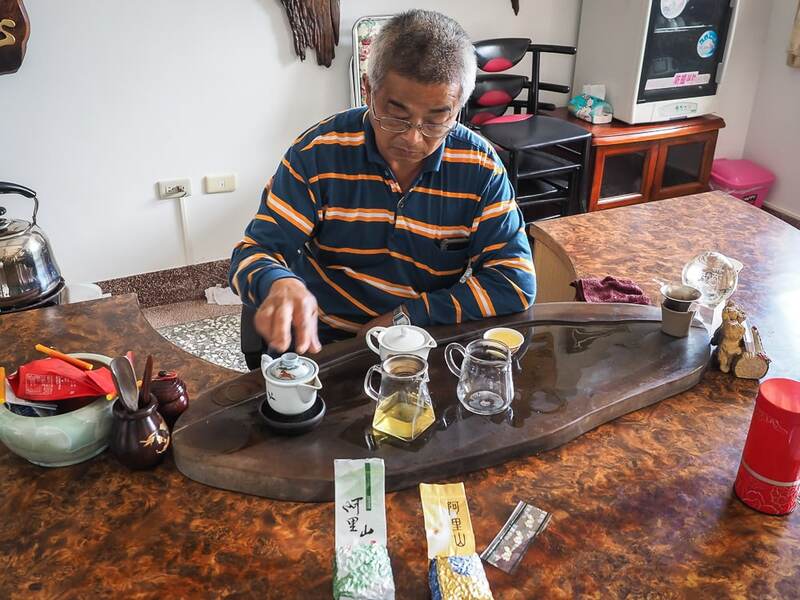 According to this great article on Shizhuo and Alishan Zhulu tea (a type of Alishan tea I’ll discuss below), it was the Taiwanese government that first encouraged locals in the Shizhuo area to grow tea, with funding from the Tea Research and Extension Station. Before that, local villagers struggled to make ends meet growing bamboo and lilies. 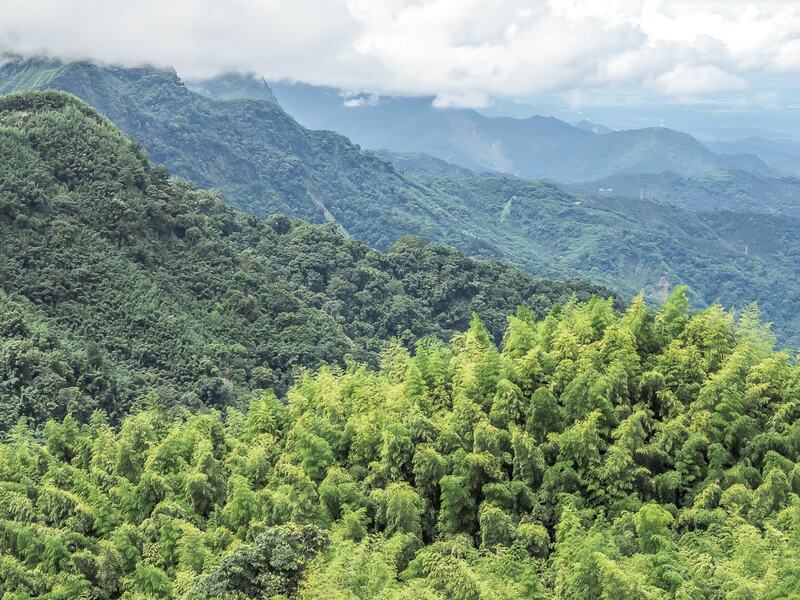 Shizhuo was much higher (1200-1500 meters) and colder than established tea growing areas at the time, and the locals struggled for years to successfully grow the plant and develop it into a local industry. Little did these tea pioneers realize that they were onto something that would have a major impact on the tea industry in Taiwan. 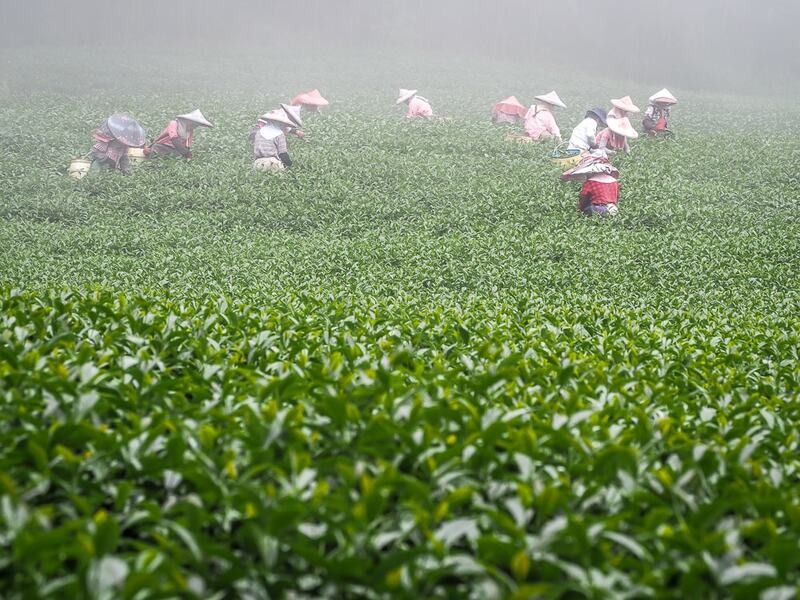 Through trial and error, these farmers and others like them began developing teas that were so good, the term High Mountain Tea (gao shan cha) was born. Today the term refers specifically to Taiwanese teas grown at an altitude of 1000 meters or higher. Higher altitudes produce hardier teas that have a higher concentration of flavor-producing components. With thinner air, lower temperatures, and fewer hours of sunlight, the leaves grow slower, concentrating the nutrients and producing flavors that are more complex. 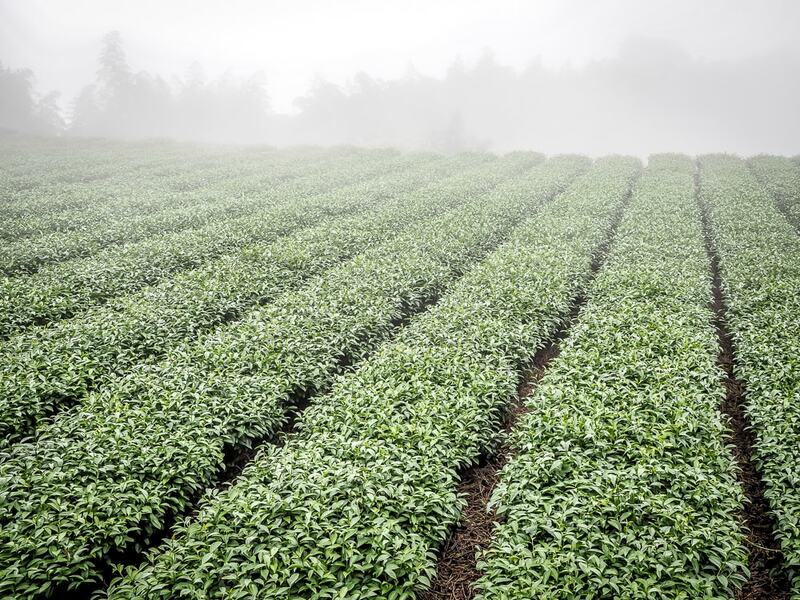 Shizhuo and other areas in the greater Alishan region turned out to have the perfect combination of altitude, cool climate, nutrient-rich soil, fresh mountain water for irrigation, and persistent fog, producing exceptional teas that are like no other. With the explosion in popularity of Alishan’s tea, farmers in other high altitude areas of Taiwan such as Yushan, Lishan, Shanlinxi, and Wushe have sought to go higher and higher, producing teas that are supposedly better and better, with the highest (and rarest) being Dayuling from Lishan, which according to some sources, is grown as high as 2600 meters. If that is true, it would mean that tea is grown in Taiwan at an even higher altitude than Kolukkumalai in South India, which many people consider the highest tea estate in the world. High altitude tea farming is labor intensive, expensive, and in most cases, terrible for the environment. That’s why these teas generally come at a cost (and also why it’s important to by from a responsible vendor like Eco-Cha). Decent Alishan tea usually sells for about US$10/ounce ($350/kg), while Dayuling can easily sell for 2-3 times that. Here’s a page with the average selling prices of various Taiwanese high mountain teas from different vendors. 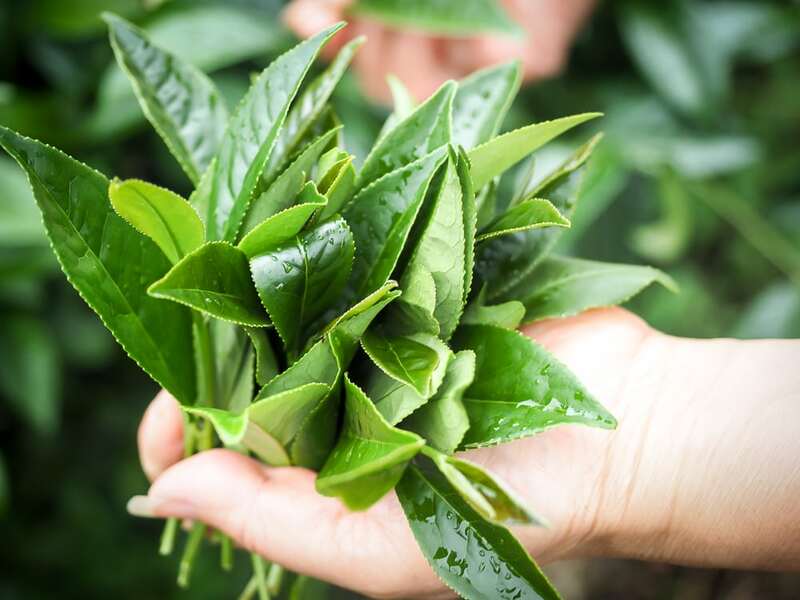 Today, most tea grown in Shizhuo, called Zhulu tea, is made with the variety Qingxin, known for its lasting sweetness and floral/fruity characteristics. Meanwhile, Zhangshuhu produces a softer and mellower tea which often wins competitions but is harder to find. It is said that the plum orchards interspersed with the tea fields in Zhangshuhu lend the tea a fruitier taste. In summer of 2018, I went to Shizhuo and Alishan as a part of my round-Taiwan trip with my two kids. I’ve explored many of Taiwan’s tea regions, and I would say that staying in Shizhuo has been my favorite, and it’s definitely the best and easiest place in Taiwan to stay on a tea farm. 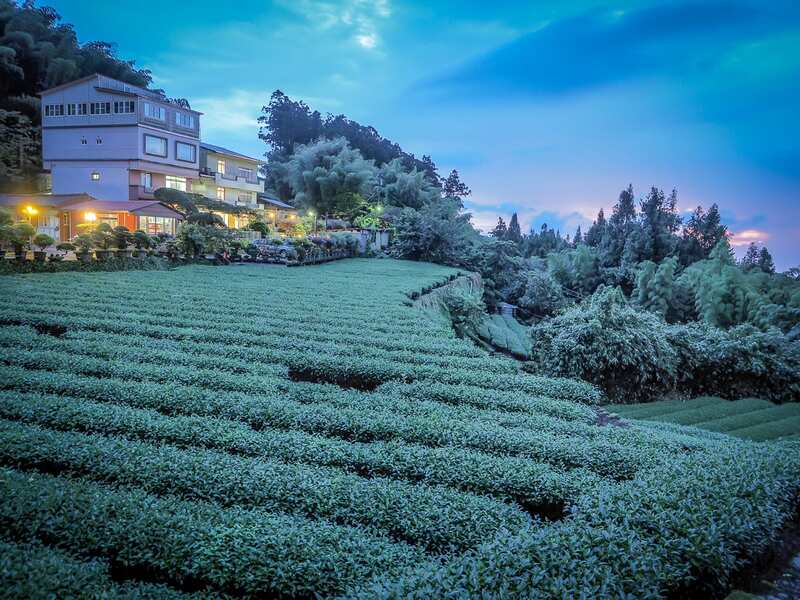 Long Yun Leisure Farm, a gorgeously situated hotel with rooms overlooking tea terraces. Shizhuo is near Fenqihu, which is currently the terminal end of the Chiayi to Alishan small train line, since the remaining portion was damaged in a typhoon in 2009. Fenqihu is a pretty and popular little mountain town that I would also recommend visiting, and a stepping stone up to the Alishan National Forest Recreation Area. Shizhuo is just south of Fenqihu, while lesser known Zhangshuhu is just north of it. Shizhuo is easier to access because all buses up to Alishan pass through it, and there are at least a dozen tea farms dotting the steep hills above the highway which offer simple guesthouse accommodations for guests. Most of the farmers/guesthouse owners are also willing to pick up guests from the train station in Fenqihu, about 10 minutes away. Shizhuo is appealing not only to tea geeks but anyone who loves scenery and hiking. There is a network of hiking trails through the highly picturesque tea farms, with names like Mist Trail, Sunset Trail, Tea Trail, Cloud Trail, and Sakura Trail. 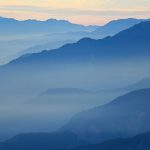 What’s more, the famed Alishan “sea of clouds” phenomenon can also be witnessed from Shizhuo, more commonly at sunset than sunrise due to its location. After the owner of Cuiti Guesthouse and Tea Farm (read reviews / see prices) picked us up in Fenqihu, he took my kids and I for a stroll through his tea planation, where workers were in the midst of harvesting the tealeaves. It was a surreal experience, with light rain and mist enveloping us. After, he directed us to a kid-friendly hiking trail, which we followed for about an hour to another very attractive tea farm. 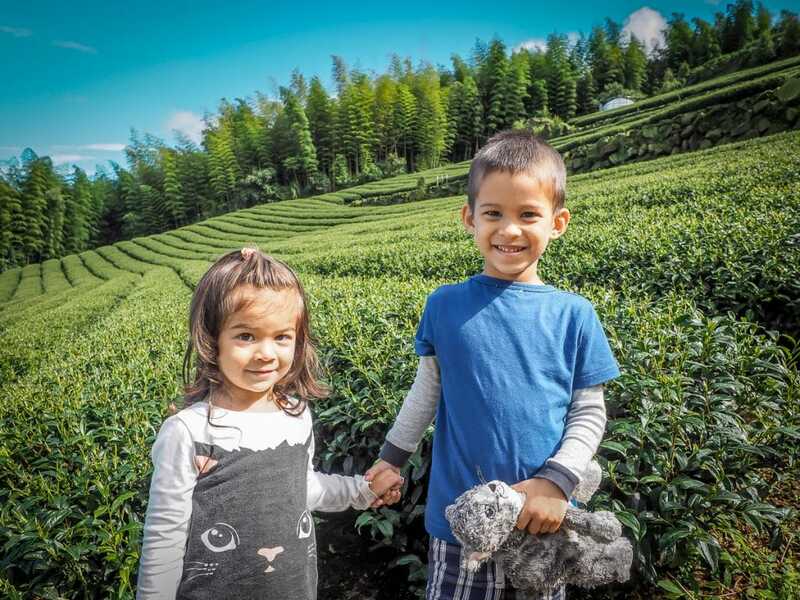 My kids in front of a tea farm that we hiked to in Shizhuo. And yes, Sage wanted to wear his shirt inside out and backwards. Even the view from our room in the guesthouse was incredible. In the evening, we didn’t think to go outside for sunset, since it had been drizzling all day, but the farmer came to our room to alert us that an incredible sunset was taking place. We were in the middle of a shower, but managed to run out and catch the tail end of it. It’s not easy to sit and enjoy tea while taking care of a 4-year-old and 3-year-old on your own, but I did manage to squeeze in a session with the farmer the next morning, sampling several teas made on site and choosing my favorite to take home. Overall, staying at Shizhuo has been of my top experiences in my 10 years in Taiwan. Here are some other tea farms besides Cuiti Guesthouse in the area that I considered when I was making my choice, all of which offer similar accommodations on beautiful tea farms. 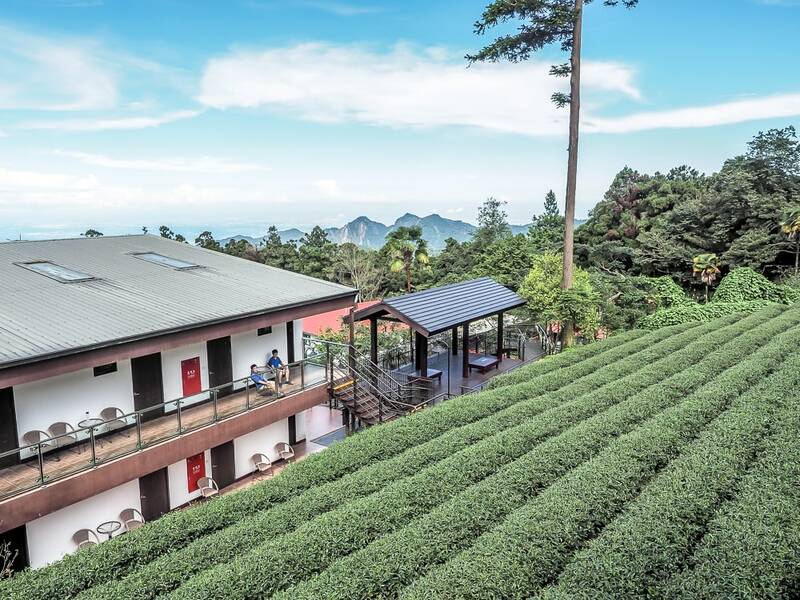 You can also visit the area on the day tour from Chiayi to Fenqihu, which includes maple foliage viewing and stops for Alishan tea, or on this 1-2 day tour of Alishan. 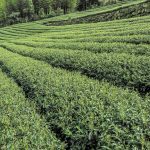 While most tea farmers harvest their crops five times per year in Taiwan, Alishan and other high mountain teas are only harvested twice per year, usually in October and June, or “winter” and “spring” teas. 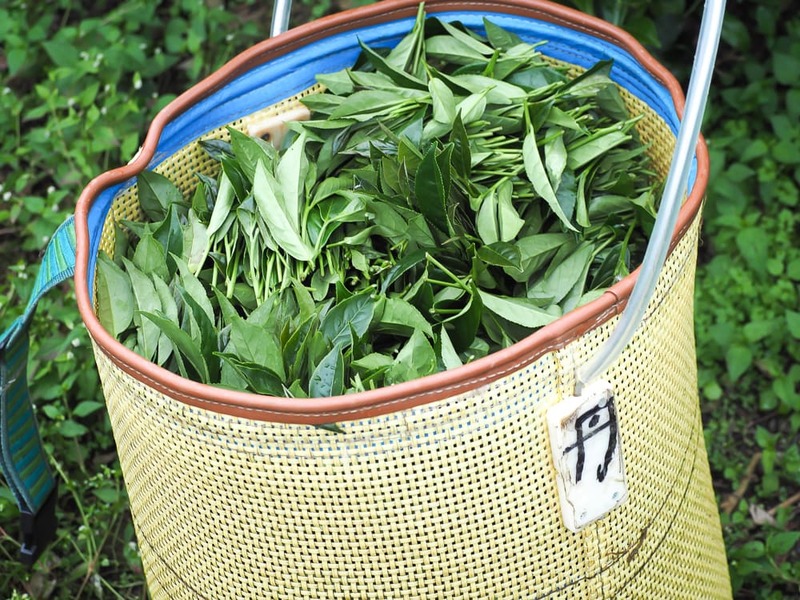 After the buds (usually consisting of 2-4 young leaves) are hand plucked, they are withered on the ground to reduce moisture then mashed/tossed on bamboo trays to break up cell tissues and initiate oxidization. They are then left to oxidize for eight hours. Next, the leaves are carefully pressed in cloth bags and rolled into balls before being fired to remove any remaining moisture and stop oxidization. 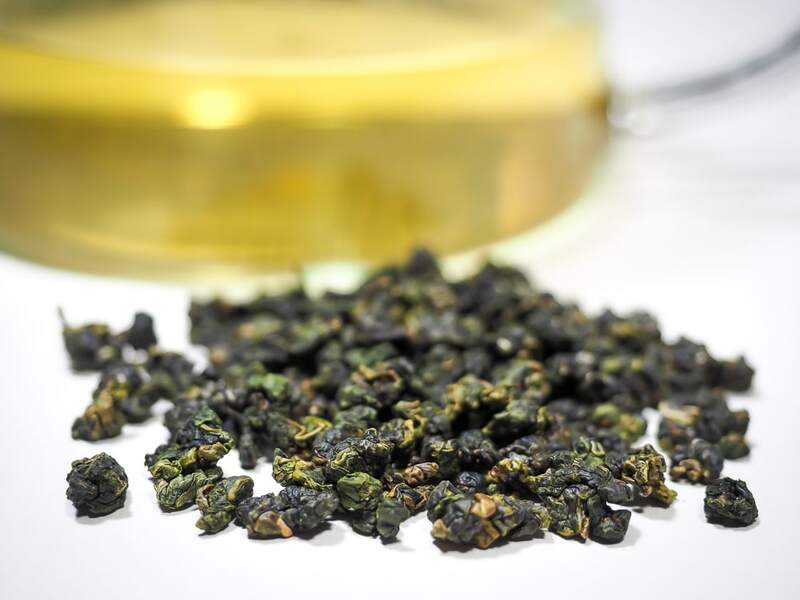 Oxidization is what differentiates oolong tea from green tea, which is pan-fried immediately after being picked. More oxidization produces a darker tea. Alishan tea is typically oxidized to 30 or 40%, which is on the light to light-medium end for oolong teas. Recommendations vary for how to make the perfect cup of every kind of tea, but generally most people recommend brewing Alishan tea with 90-95° water. Basically you can boil it then leave it for 30 seconds, or invest in a water boiler with temperature presets. If you prepare tea Western style, that is, a large cup steeped once, 1 teaspoon of leaves for 8 ounces of water, steeped for three minutes is recommended. Gongfu style or in an Yixing tea pot, you’ll want to go with more tealeaves, such as 3 teaspoons, and they can be steeped up to 6 or even 8 times (personally, I usually steep about 4 times). I feel that these guidelines are flexible, and it’s up to each person’s individual taste. Just experiment to find out what proportions and steeping time work best for you! It was while visiting the tea farm on Alishan that I first learned they also produce black teas in the area, usually called Alishan Honey Scented Black Tea (Alishan mixiang hong cha or 阿里山密香紅茶). Like Alishan’s oolong teas, its black teas are really quite exquisite. They are smooth and non-astringent, fruity, with hints of cinnamon, caramel, and a natural honey scent and flavor. 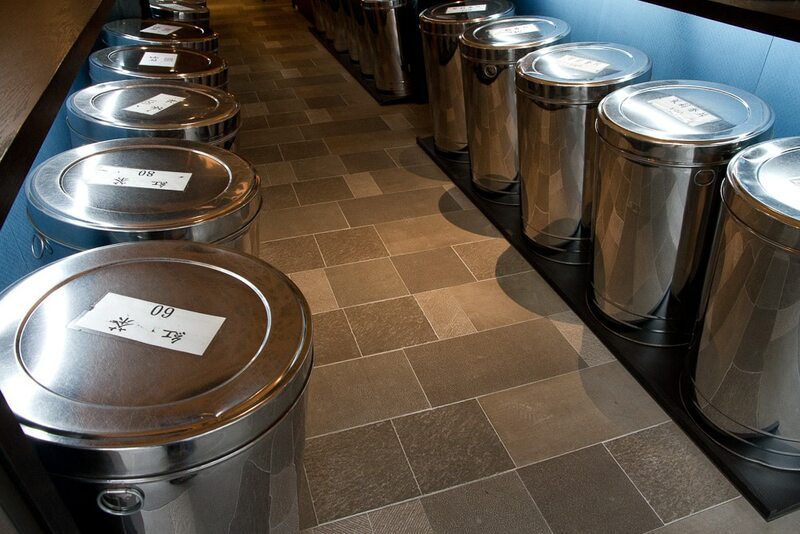 They are usually made with Jinxuan variety, but the tea loses its creaminess when it is fully oxidized. The way that the tea takes on its honey flavor is quite interesting. Because the tea is usually grown without pesticides, little bugs called leafhoppers nibble on the leaves. The plant’s immune system response is to release a chemical that, once roasted, produces a scent and taste very similar to honey. If you are accustomed to drinking flavored teas (teas with added flavors), be aware that this honey flavor is not overwhelming like the flavor in a flavored tea. It’s just a subtle hint of natural flavor that you may barely even notice, depending on how sensitize your palate is, and how many different teas you drink, if the same way that non-wine drinkers may have more difficulty noticing the “blackberry undertones” in their Cabernet Sauvignon. I brought a bag of Alishan Honey Scented Black Tea home from the tea farm I stayed on in Shizhuo, and I love it as a morning tea. Ben from Ai-Want Formosa Tea was also gracious enough to send me a bag, by coincidence, shortly after my trip to Alishan. Click here to order Alishan Honey Scented Black Tea from Ai-Want Formosa Tea. 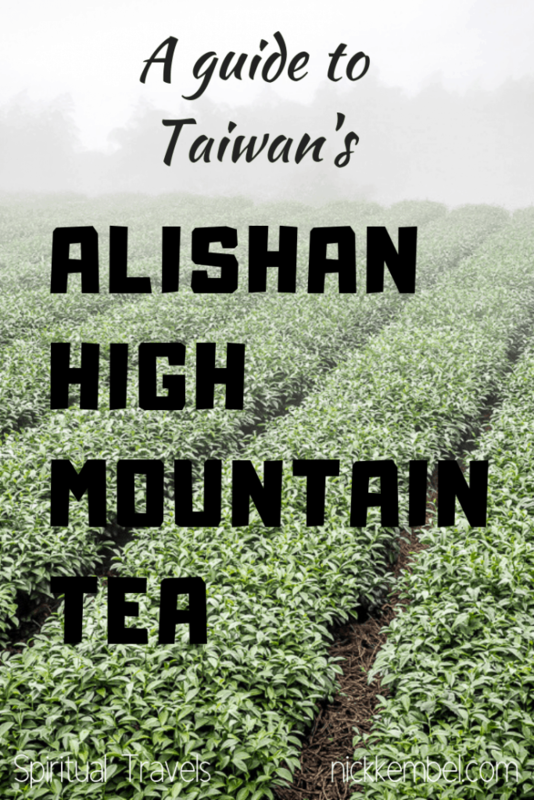 You may be surprised at how easy it is to find Alishan High Mountain Tea in Taipei. Almost every tea seller seems to have it, not to mention every grocery store in town. However, I wouldn’t trust the latter if you want to purchase authentic, quality Alishan tea. My go-to place for buying Alishan and other classic Taiwanese teas like Tieguanyin, Oriental Beauty, and Baozhong, are the neighboring shops of Lin Mao Sen Tea Co 林茂森茶行 (195-3 Chongqing N Rd, MRT Daqiaotou 重慶北路195-3號，捷運大橋頭站) and Lin Hua Tai Tea (林華泰茶行), owned by two rivaling brothers. At either shop, you can purchase a range of quality of Alishan High Mountain teas, from NT4000 (US$130) per jin (600g) for the top grade stuff, NT2400 for the second best, NT1600 for the third, and so on. The minimum amount is quarter jin, or 150g, which is a decent sample size. Workers in both shops speak great English and are happy to answer any questions, and while Lin Mao Sen has a prettier storefront, both shops sell very similar, reliable, quality bulk tealeaves as very reasonable prices. 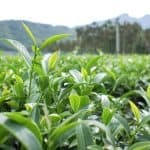 If you do a quick search online, you will find many companies specializing in Taiwanese teas that ship internationally, but in this article article I only recommend ones that I have personally ordered from. Disclosure: This page contains affiliate links. These are products and services that I personally use and recommend. If you click on one and buy something, I get a small commission, at no extra cost to you. Eco-Cha and Ai-Want Formosa Tea provided me with some free tea samples, some of which I used for writing this article. As always, all opinions are my own. Nick this tea sounds so tasty. Plus how about that forest! Looks like something out of a movie. Excellent post buddy. Thanks for sharing. The tea sounds amazing, and your photos are always so fantastic. I feel like I was there with you, especially with the captures of the local people. Great post! Thanks, Sage. Yours words are much appreciated! Great photos and I after reading this, I felt I already know everything there is about Alishan Tea!